Fall baking is one of my favorite past times, and whether you’re baking this cake for fun or for Thanksgiving, it’s sure to please. 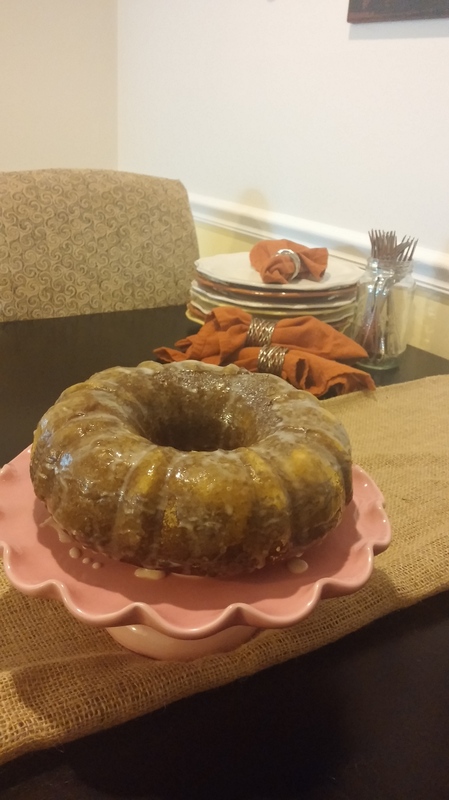 My Glazed Double-Chocolate Pumpkin Bundt Cake starts with a boxed cake mix and is filled with classic fall spices. Black coffee adds depth of flavor and canned pumpkin gives the cake a delectably moist texture, making it a wonderful addition to any holiday celebration. A recipe is only as good as the quality of its ingredients. For the batter, I used pure vanilla extract from Cozumel, Mexico, that I picked up on vacation earlier this year. 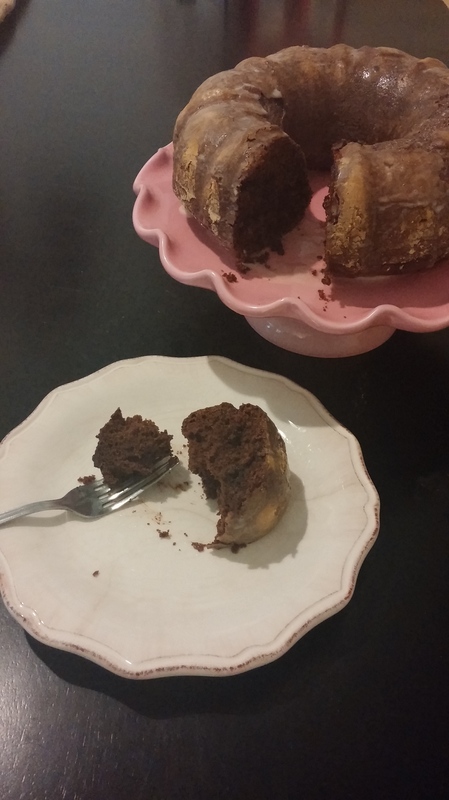 I also baked the cake using Hunter Cattle Company’s pasture-raised chicken eggs. 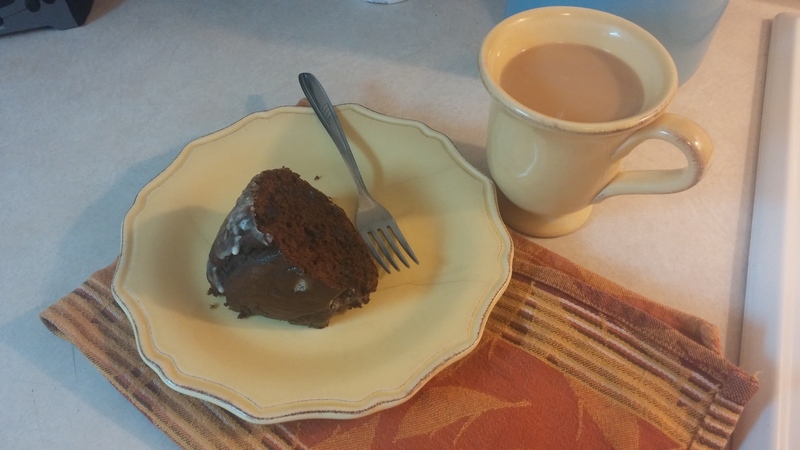 The cake is even better served with coffee. Grease and flour a standard bundt pan. Set aside. Preheat oven to 350. Combine all ingredients, except chocolate chips and flour, together using a mixer until well blended. In a separate bowl, mix flour and chocolate chips. The flour will prevent the chocolate chips from sinking to the bottom of the cake. Add chocolate chips to the Devil’s Food Cake mixture. Pour ingredients into the bundt pan and smooth the top. Bake cake for 1 hour to 1 hour and 15 minutes or until a toothpick inserted in the center comes out clean. Let cool 15 minutes in the pan, then transfer to a wire rack to cool completely. For the glaze, combine confectioners’ sugar, half & half and vanilla. The consistency should coat the back of a spoon and not be too runny. Using a spoon, drizzle glaze over the top of the cake, allowing it to run down and around the sides. You may not use the entire glaze; just add it until you’re satisfied with the presentation. Serve with coffee any time of day and enjoy! Are you baking or cooking something Some Kinda Good this Thanksgiving? If so, and you’d like to share, I’d love to see your photos. Share them with me on social media using #SKGThanksgiving. Bek, these would make wonderful Christmas baked gifts. I wonder if I baked these in little small loaf pans, how it would turn out? Thanks for sharing. I hope you bring some to Thanksgiving!! LOL. REally I am not kidding. Want to try some.